We LOVE Brinca Dada! We featured their modern doll houses a while back and we are so happy they are doing a giveaway for us! See below on how to win! 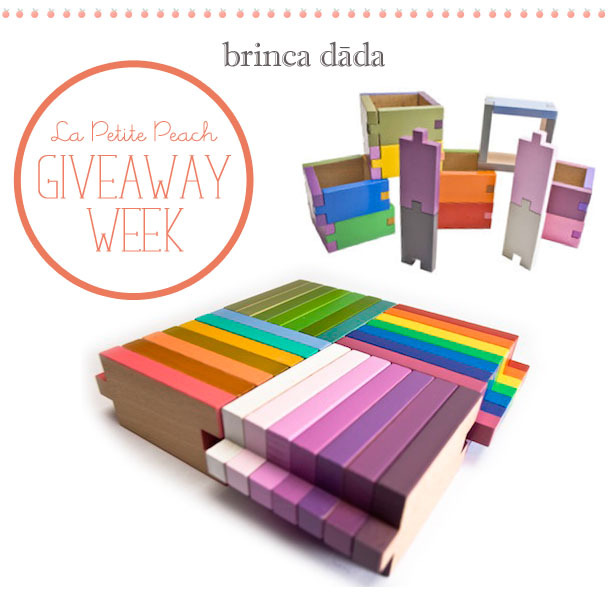 To win the Kaleidos: Leave a comment on Brinca Dada’s Facebook page, and make sure to mention the post on La Petite Peach! We will announce the winner on our Facebook page tomorrow! About Kaleidos: “Kaleidos from Brinca Dada is one of five new “Colortoys” that allows children to discover how color works as they construct with 42 different colors, with notched units that allow for various combinations of hue, value, and intensity—the basic attributes of color. The building design possibilities are expanded since color appears on five sides and natural wood grain on the sixth. Kaleidos was designed by renowned toy designer and early childhood education expert, Karen Hewitt of Learning Materials Workshop. Previously available to schools and other educational institutions, Kaleidos is now available to the public through a partnership with Brinca Dada. I have fallen for these blocks! So colorful and I love that they interlock. Thank goodness for La Petite Peach. There will be enough blocks for each!